A few weeks ago I wrote a blog on getting started with Hazelcast describing how ludicrously simple it is to create distributed maps, lists and queues. At the time I mentioned that Hazelcast does quite a few other things besides. This blog takes a quick look at another of Hazelcast’s features: its broadcast messaging system based on the Publish/Subscribe pattern. This takes the usual format where by the message sender app publishes messages on a certain topic. The messages aren't directed at any particular client, but can be read by any client that registers an interest in the topic. The obvious scenario for publish and subscribe comes from the world of high finance and market makers. A market maker both buys and sells financial instruments such as stocks and competes for business by advertising both a buy and sell prices in a, usually electronic, market place. To implement a very simple market maker scenario using Hazelcast we need three classes: a StockPrice bean, a MarketMaker and a Client. The following code has been added to my existing Hazelcast project that’s available on Github. There are no additional POM dependencies to worry about. The StockPrice bean, with all the usual getters and setters, models a stock’s ask and bid price (sell and buy in normal language) at any given time and the MarketMaker class publishes these beans using Hazelcast. Normally a market maker will publish prices in more than one financial instrument; however, for simplicity, in this demo theMarketMaker only publishes a single price. The final part of the MarketMaker class is the main() method and all this does is to create several MarketMaker instances and sets them running. 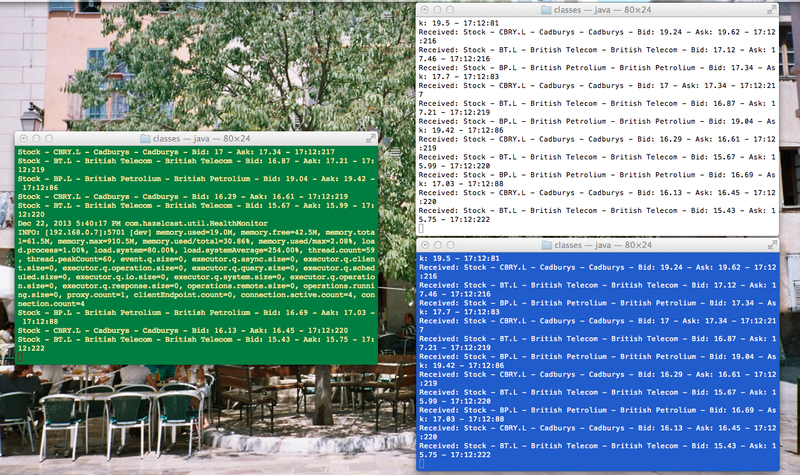 Now that Hazelcast knows about our ever changing stock prices, the next thing to do is to sort out the client code. The final part of the client code is its main() method that creates a client instance. 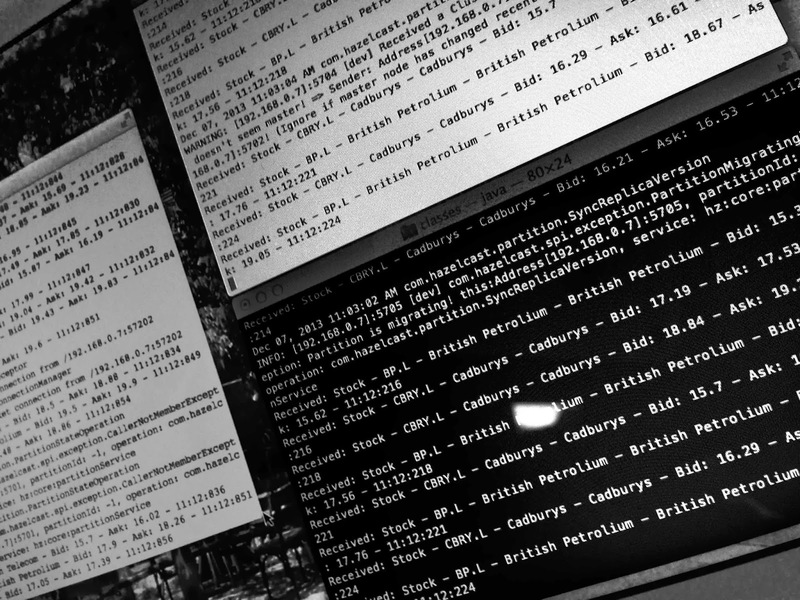 The final thing to do is to run the code. 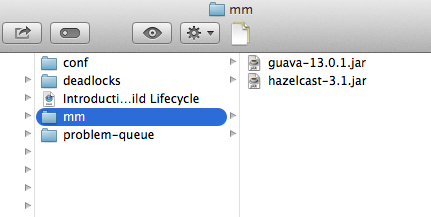 For this I’ve simply put all the necessary JAR files in a single directory and there’s only two to consider: hazel cast-3.1.jar and guava-13.0.1.jar. Of course, if you’re running this on your machine using this rough and ready technique, then remember to replace/Users/Roger/tmp/mm with the path to the place where you’ve put your copies of these JAR files. 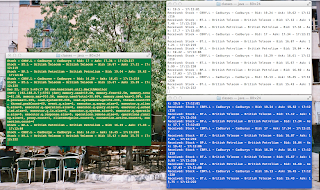 If you run a MarketMaker publisher in one terminal and a couple of clients in two other terminals, then you’ll get something like this, where you can see the prices being published and the clients receiving updates. In the above log, there are two listener entries, one for each client process, and three publisher entries, one for each of theMarketMaker instances started in the MarketMaker’s main() method. The thing to consider here is whether or not it’s good practice to create a Hazelcast instance per object instantiation (as I’ve done in the sample code) or is it better to have a single static Hazelcast instance in your code. I’m not sure of the answer to this so if there are any Hazelcast gurus reading this please let me know.